Ahh, Influencers. A key component to your social media and inbound marketing success. Not only do we need them to propel our marketing efforts to the next level, but they also play a large part of your relationship marketing strategy. An Influencer campaign should be a part of your social media engagement strategy. Everyone defines an Influencer differently. In my opinion, an Influencer is someone who has the power or clout to persuade or “woo” their network. They are tastemakers, compelling people to listen to what they have to say and, hopefully (in the case of Influencer marketing), engage with their message. There is a common belief that Influencers must have a huge network. Of course, the bigger the network, the more people will be influenced by the suggestions, referrals, and thoughts of the Influencer. But this isn’t always the case. An Influencer can have a compacted network and still be influential. In fact, anyone can be an Influencer if they have the ability to engage with and influence the decision making of just one person. While this person, the Influencer, is still influential to someone, their circle of influence is a lot smaller. With that said, the amount of followers or fans does not determine influence. Rather, how respected the person is determines the amount of influence they may have. Another thing to note is that these so-called Influencers don’t have to be influential or popular on all networks. They can have influence on one social network, but not another. Nor do they have to be influential on all topics. They can be highly influential about one niche, but not so influential about other things. When thinking about who your Influencers are and how to make the most impact with your Influencers, you must think about who their audience is. They should be similar to yours. You don’t want to find an Influencer who talks about board games when you are selling t-shirts. That’s not going to work in your favor. The more targeted the Influencer is to your audience, the more impact you will have in your influencer marketing and brand ambassador campaigns. Influencers are different than brand ambassadors which we will get into later. These influencers can get bring you brand ambassadors by introducing them to your product. 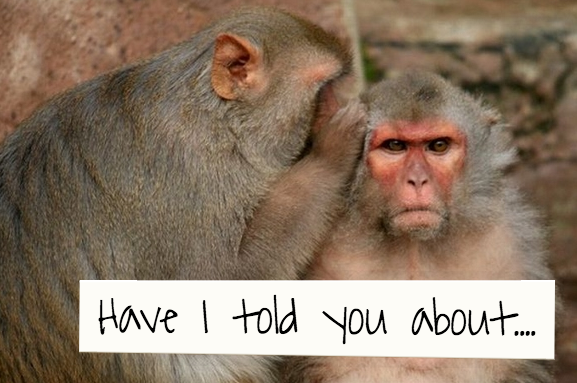 It’s your customer who will be your best brand ambassador. The social butterfly is someone who is a serial networker. They’re out there making connections and can often be influential about a variety of different things. These people are usually found on various networks and often times have a large following on each. These are the the trendsetters. They are often found first on new networks and are always scouring the web for cool things that no one knows about yet. Until they let it loose, of course. This is the person who is a specialist. They have a strong built in following based on what they know and their experience. These are great people to have backing your brand. Literally, the celebrities. These are people like Rachel Zoe, the Kardashians, Britney Spears, Oprah, and all the other celebrities who have a huge following and can influence all of their fans. You might have to pay for them to promote your brand, but if they just so happen to love your brand, you’re golden! It’s very likely that this person is a blogger, author, vlogger, podcaster, designer, or has some expertise in other forms of content creation. These people are awesome! Make friends with them. This is the publicist type. They like to share content and they like to share a lot of it. Often times, these people over-share which makes their voice less heard. But these people can still add value to your message. These are the people who use your product or engage with your brand. They might not have a network that large, but they’re still valuable because they actually use your product! They are fans and while they may not be sharing all over the social web, they are still going to refer their friends to you if they take a liking to you. These are the people you want as your brand ambassadors. Now that we know what an Influencer is and what kinds of Influencers are floating out there, we have a lot to go over. In my next post we’ll talk about where you can find these Influencers and how to engage with them on the social web. Which kind of Influencer are you? Although I wish I were a celebrity, I’m a content creator. What kind of influencer are you? 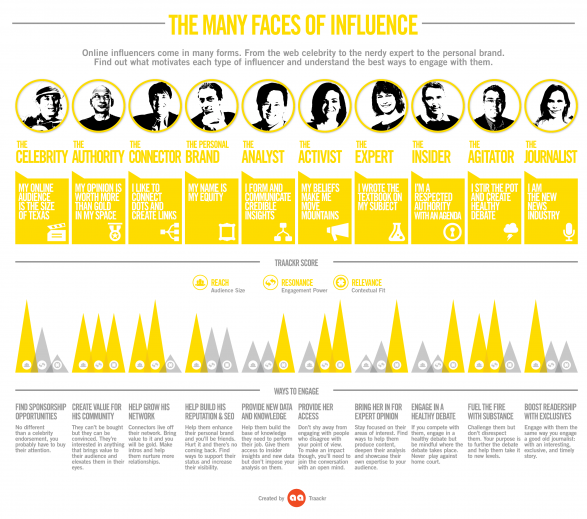 Great breakdown of influencer types, not too broad, not too narrow, thus easy to navigate for people looking to understand the nature of this new beast that is influencer marketing! That’s very interesting. I have noticed baby boomers act a certain way online and particularly within facebook they seem to share things more easily that people my age. I think they might be an influencer group in their own right. Can you be more than one? I think I’m a social butterfly and a content curator but also the publicist!